Kevin West, artist and entrepreneur, to speak at 2016 Terre Haute Startup Weekend. We’re excited to have such a dynamic speaker for our Startup Weekend event! 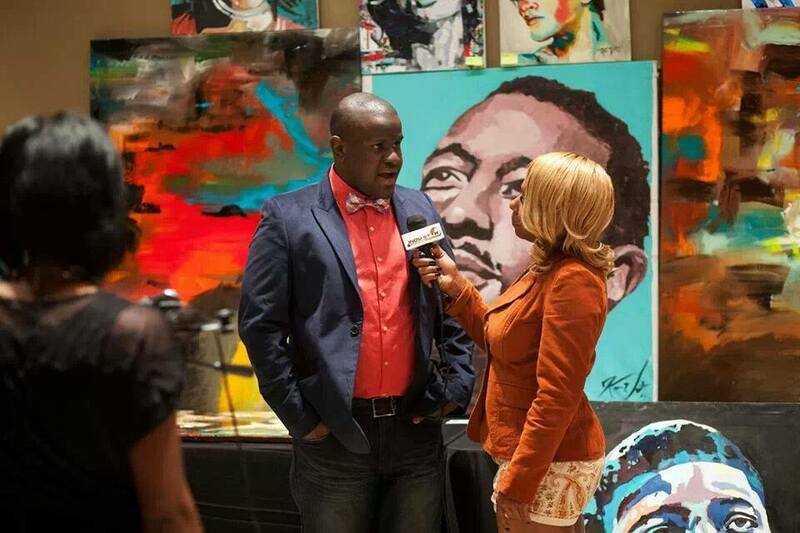 Just look at the recent news story done on Mr. Kevin West, artist and entrepreneur. His workshops are unbelievably incredible. One by one, everyday people with no artistic backgrounds, hold up masterpieces that they seem to have magically created on their own. The portraits, comprised of all different colors and faces, have one thing in common: each image represents a person the participant of the workshop loves. Whether the finished product reveals a spouse, child or best friend, the art produced illustrates the very core of the art instructor’s philosophy: paint what you love. 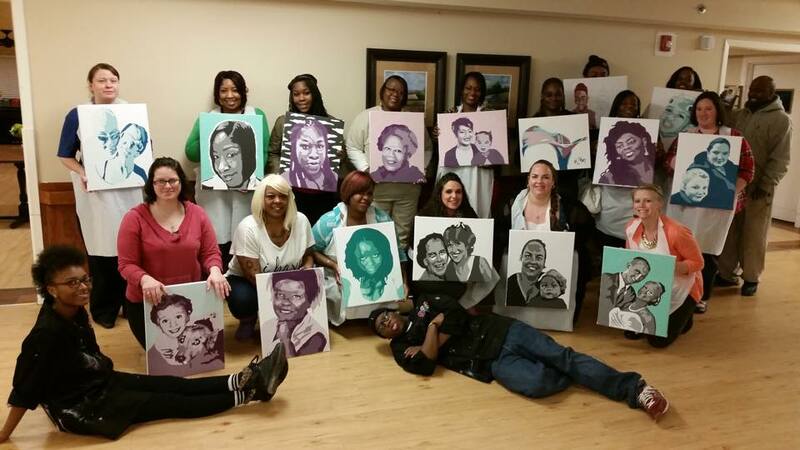 Full of warmth, creative energy, encouragement and passion, 34 year old artist Kevin Nance-West not only inspires future generations of artists, but he encourages adults to channel their artistry as well. Whether running a workshop, painting abstract designs for a neighbor’s’ home, collaborating with schools or simply painting a portrait of his daughter, West is for the people. Despite being a professional artist with over 15 years of experience, this Indiana based painter never graduated from college (though he did attend Danville Area Community College). In fact, his journey is as unique as his approach to art. In many ways, his artistry started as a kind of therapy. Diagnosed with stage three cancer, West was forced to reevaluate what was most important in his life. That of course, was his family, comprised of his wife Roshawn Scott West and their daughter Brooklyn. But in lieu of cancer bringing his spirits down, West channeled the little energy he had into his art, by painting what he loved. As if his works of art were tangible expressions of his prayers, West won his battle with cancer. Years later, he’s still painting portraits of people. West’s artistry embodies a modern style. Colorful and realistic, his portraits carry the essence of the person he’s painted. He has a particular fondness for creating acrylic paintings of celebrities and pop icons. His abstract work, often custom designed, is generally vibrant and illuminating, adding light to almost any room in a home or corporate office. One of his most memorable paintings, “Deception,” demonstrates the vast range of West’s ability. The painting shows the back of a woman’s body. Her bare skin is covered by red streaks tossed onto the canvas. Her hands are wrapped around her body. In a similar fashion, West’s art is tightly wrapped around and involved in his local community. 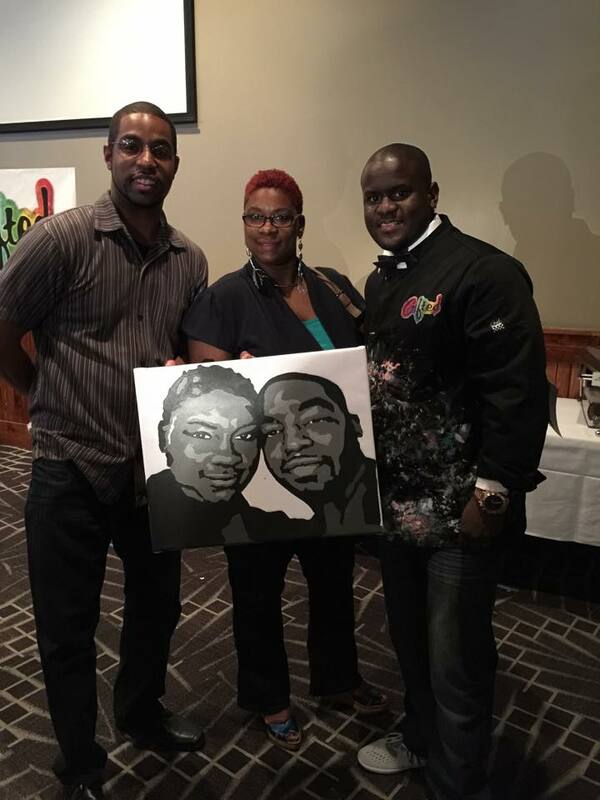 His latest venture, Gifted Custom Art, is one of the many ways West is an artist for the community. Following his surgery to remove a football sized tumor, West found himself in the garage painting. After printing out a photo for his daughter to paint, he converted the photo into a simplified paint by number image. Within an hour’s time, Kevin envisioned expanding this technique. Today, Gifted Custom Art is the first fully automated paint by number organization. Based in Indiana, the company has branches in Michigan, Illinois and Missouri and is expected to have a location in every state by the beginning of 2016. With every new location, West is inviting people to paint what they love and people are doing just that. Jake, one of West’s younger students painted a picture of his 4th grade teacher. Shocked and amazed, his teacher received the gift with great joy. It’s moments like this that put West’s heart on display. Though talented, he’s not selfish. Instead, he wants to share the gift of art with the world. And the Winner Gets a New Car……..
We want to see your idea taken to the next level. Thanks to our sponsors and generous supporters of entrepreneurship we have put a prize package together to help you launch your business faster. The prize package is still developing so check back often!